I was surfing some craft site that let people show off their crafts when I stumbled upon the best idea for reusing an old entertainment center(See here for the project that inspired me). 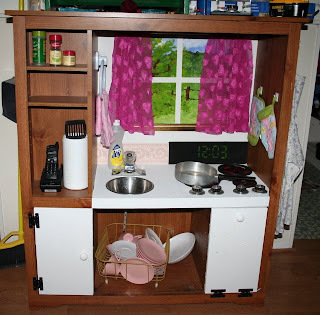 When I moved to the new house, I no longer needed my entertainment center, so I worked on converting it to a child's play kitchen. First, I marked off the areas that I wanted to paint white. I painted the sink, stove, fridge and oven door area white. I used masking tape to keep the paint from straying off onto areas I did not want painted. Paint was leftover house paint from the previously owned house. I then took a peice of scrap drywall (Could use plywood or cardboard) and nailed it into the back of the unit so there was no hole and a place to put my "window" and painted that white as well. Then I had to find a faucet. The cheapest at Lowe's was $15, didn't want to pay that much; found a sink and faucet at a thrift store for $2.oo. Later when I bought my new house I had extra faucets galore. Now, I would probably ask on freecycle first. I bought a small steel mixing bowl at the thrift store for $.25 for the sink. I got out my hubby's jigsaw and cut a circle just slightly smaller than the bowl to let the bowl lip sit on the wood and then used my hubby's cordless screwdriver and hole saw bits to make three holes for the faucet pipes to sit through and used the nut to fasten on the faucet. I bought an old dish drainer at a thrift store for $.25. Leftover washed soap container and scrubbie that I got for Christmas went to complete the sink. Next was the stove. This was a bit tricky. Stove knobs were pricey too. So I went to a place that sold used appliances and asked if they had any old stove knobs. They did; they were pretty bent from whoever tried to pry them off and one knob of the set was missing, but they gave them to me for free. The burners are four Folgers Coffee Lids that I cut small "burner hole strips" to make it resemble an electric element burner. Underneath where I attached them with a screw to the TV center, I painted the surface red to make it look like it was on fire. My hubby drilled a hole through the top of the knobs and attached them to the TV center with a screw. Then he filed off the tip so there was no sharp edge projecting below the stove. Bought a tiny skillet from thrift store for $.25. For the Window/Wall area, I took some leftover wall paper trim and glued it behind the sink. For the Stove Console, I painted it black. When it dried, I painted on a green digital clock. For the window, I had a broken mirror frame left over from the previous tenants that I used to make the window frame. For the outdoor scene, I used tempera paints and my imagination. To make the cross hatches for the window panes, I first layed out masking tape in the area, painted the whole scene and then tore off the masking tape to take away the paint "behind" the window frame. I made curtains out of an old Victoria Secret nightgown just by cutting the gown into two rectangles and straight sewing a hem at the top which I threaded through with yarn. I attached the yarn to the top edge of the picture frame so that the curtains could slide open and closed. I placed two nails at the top right and top left of the painted window and hung the window frame on it. For the Towel Ring, I found this one at the dollar store. It was adhesive, so I just stuck it on there. I bought some $.97 adhesive hooks to hang up my pot holders. I found the potholders in the After Easter Walmart Clearance aisle for $1.00. I tore one apart and made it into a miniature pot holder mitten with my sewing machine. The matching towel was $.50. For the oven, I moved the hinges to the bottom, so the door would open down. I made a new hole for the doorknob at the top of the oven door. I filled the old doorknob hole with paint. All accomplished by a screwdriver and drill bits. For the sides, I hung one of the adhesive hooks to hold an apronthat I fashioned from an old skirt. And on the "pantry" side, I used ice cream buckets to organize kitchen accessories and attached a phone that I got from a thrift store on free day. I kept all my used spice containers and kitchen containers to help stock up the pantry. UPDATE : Someone else did one: check out theirs for the possibilities depending on your TV center. We made the Cribs one from Craftster. Yours is so good! Oh my gosh, this is adorable! Great job. BTW, I linked your picture. I'll delete if this is a problem...I just got so excited by how well this turned out that I wanted to share it. No problem, link away! 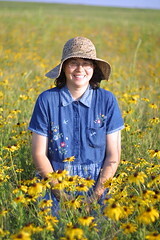 I know that the one Jesse did on Craftster really inspired me and in fact, looking at your blog, I may have found it through you if I am remembering correctly it's been quite a while ago. wow that looks better than the ones you buy at the stores ,mind if i borrow your idea for my girls?and link to it from my blog? sure go ahead, I hope people steal the idea for their kiddos and as I mentioned, I got it from someone else's genius, so I hope lots a little girls benefit from it. In fact I have had older girls (10-12 yr old) play with it as well, it is a very cute project. OMG. What a great idea!!!! My cousin just sent me a link to this. The genius and creativity involved in the creation is phenomenal. I SO wish I hadn't given my old entertainment center away! If I ever come across a really cheap one, I am totally snatching it up and turning it into a summer project with my daughter. Have any ideas for an old, ugly desk? This is a fantastic idea. 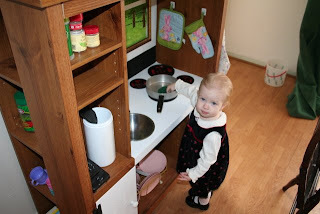 I know that my kids love their play things, but the kids kitchen sets that you see at the stores can cost a lot. Thanks for the great tip.